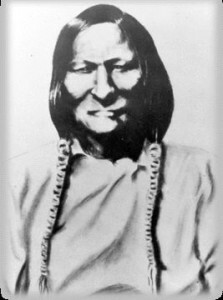 Few biographical details are known about the Southern Cheyenne chief Black Kettle, but his repeated efforts to secure a peace with honor for his people, despite broken promises and attacks on his own life, speak of him as a great leader with an almost unique vision of the possibility for coexistence between white society and the culture of the plains. militia for a parlay when the shooting began. This incident touched off an uncoordinated Indian uprising across the Great Plains, as Indian peoples from the Comanche in the South to the Lakota in the North took advantage of the army’s involvement in the Civil War by striking back at those who had encroached upon their lands. Black Kettle, however, understood white military supremacy too well to support the cause of war. He spoke with the local military commander at Fort Weld in Colorado and believed he had secured a promise of safety in exchange for leading his band back to the Sand Creek reservation. Camp Weld Council, September 28th, 1864. Standing L-R: Unidentified, Dexter Colley (son of Agent Samuel Colley), John S. Smith, Heap of Buffalo, Bosse, Sheriff Amos Steck, Unidentified soldier. Seated L-R: White Antelope, Neva, Black Kettle, Bull Bear, Na-ta-Nee (Knock Knee). Kneeling L-R: Major Edward W. Wynkoop, Captain Silas Soule. Photo Credit: Colorado Historical Society. All rights reserved. Only known photo of Chief Black Kettle, pictured here in the second row, third from left, at the peace negotiations at Camp Weld. But Colonel John Chivington, leader of the Third Colorado Volunteers, had no intention of honoring such a promise. His troops had been unsuccessful in finding a Cheyenne band to fight, so when he learned that Black Kettle had returned to Sand Creek, he attacked the unsuspecting encampment at dawn on November 29, 1864. Some two hundred Cheyenne died in the ensuing massacre, many of them women and children, and after the slaughter, Chivington’s men sexually mutilated and scalped many of the dead, later exhibiting their trophies to cheering crowds in Denver. western Kansas for a time. driven to join Roman Nose and his band. It was Black Kettle’s village, well within the boundaries of the Cheyenne reservation and with a white flag flying above the chief’s own tipi. Nonetheless, on November 27, 1868, nearly four years to the day after Sand Creek, Custer’s troops charged, and this time Black Kettle could not escape: “Both the chief and his wife fell at the river bank riddled with bullets,” one witness reported, “the soldiers rode right over Black Kettle and his wife and their horse as they lay dead on the ground, and their bodies were all splashed with mud by the charging soldiers.” Custer later reported that an Osage guide took Black Kettle’s scalp. On the Washita, the Cheyenne’s hopes of sustaining themselves as an independent people died as well; by 1869, they had been driven from the plains and confined to reservations. The cultural collision between pioneers and Indians reached its peak on the Great Plains during the decades before and after the Civil War. U.S. Government policy sought to separate tribes and settlers from each other by establishing an Indian Territory (present-day Oklahoma). Some Plains tribes accepted life on reservations. Others, including the Cheyennes, Kiowas, and Comanches, did not. They continued to hunt and live on traditional lands outside the Indian Territory. At first, this choice produced little conflict. But following the Civil War, land-hungry settlers began penetrating the plains in increasing numbers, encroaching upon tribal hunting grounds. Indians could no longer retreat beyond the reach of whites, and many chose to defend their freedom and lands rather than submit to reservation life. Events leading to the Battle of the Washita began with the Sand Creek Massacre of 1864. On November 29, troops under the command of Col. J.M. Chivington attacked and destroyed the Cheyenne camp of Chief Black Kettle and Chief White Antelope on Sand Creek, 40 miles from Fort Lyon, Colorado Territory. Black Kettle’s band flew an American flag and a white flag, and considered themselves at peace and under military protection. The terrible slaughter caused a massive public outcry. In response, a federal Peace Commission was created to convert Plains Indians from their nomadic way of life and settle them on reservations. On the Southern Plains, the work of the Commission culminated in the Medicine Lodge Treaty of October 1867. Under treaty terms the Arapahos, Cheyennes, Comanches, Kiowas, and Plains Apaches were assigned to reservations in the Indian Territory. There they were supposed to receive permanent homes, farms, agricultural implements, and annuities of food, blankets, and clothing. The treaty was doomed to failure. Many tribal officials refused to sign. Some who did sign had no authority to compel their people to comply with such an agreement. War parties, mostly young men violently opposed to reservation life, continued to raid white settlements in Kansas. Major General Philip H. Sheridan, in command of the Department of the Missouri, adopted a policy that “punishment must follow crime.” In retaliation for the Kansas raids, he planned to mount a winter campaign when Indian horses would be weak and unfit for all but the most limited service. The Indians’ only protection in winter was the isolation afforded by brutal weather. Black Kettle and Arapaho Chief Big Mouth went to Fort Cobb in November 1868 to petition General William B. Hazen for peace and protection. 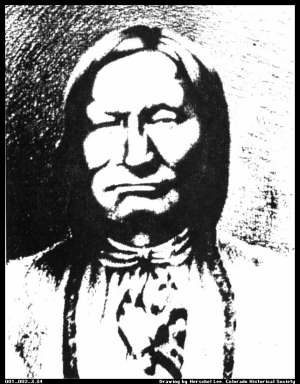 A respected leader of the Southern Cheyenne, Black Kettle had signed the Little Arkansas Treaty in 1865 and the Medicine Lodge Treaty in 1867. After giving the two chiefs flour, blankets, and other goods, Hazen told them that he could not allow them to bring their people to Fort Cobb for protection because only General Sheridan or Lt. Col. George Custer, his field commander, had that authority. Disappointed, the chiefs headed back to their people at the winter encampments on the Washita River. Even as Black Kettle and Big Mouth parlayed with Gen. Hazen, the 7th Cavalry established a forward base of operations at Camp Supply, Indian Territory as part of Sheridan’s winter campaign strategy. Under orders from Sheridan, Custer marched south on November 23 with about 800 troopers, traveling through a foot of new snow. After four days travel the command reached the Washita valley shortly after midnight on November 27, and silently took up a position near an Indian encampment their scouts had discovered at a bend in the river. Black Kettle, who had just returned from Fort Cobb a few days before, had resisted the entreaties of some of his people, including his wife, to move their camp downriver closer to larger encampments of Cheyennes, Kiowas, and Apaches wintered there. He refused to believe that Sheridan would order an attack without first offering an opportunity for peace. Before dawn, the troopers attacked the 51 lodges, killing a number of men, women, and children. Custer reported about 100 killed, though Indian accounts claimed 11 warriors plus 19 women and children lost their lives. More than 50 Cheyennes were captured, mainly women and children. Custer’s losses were light: 2 officers and 19 enlisted men killed. Most of the soldier casualties belonged to Major Joel Elliott’s detachment, whose eastward foray was overrun by Cheyenne, Arapaho, and Kiowa warriors coming to Black Kettle’s aid. Chief Black Kettle and his wife were killed in the attack. Following Sheridan’s plan to cripple resistance, Custer ordered the slaughter of the Indian pony and mule herd estimated at more than 800 animals. The lodges of Black Kettle’s people, with all their winter supply of food and clothing, were torched. Realizing now that many more Indians were threatening from the east, Custer feigned an attack toward their downriver camps, then quickly retreated to Camp Supply with his hostages. The engagement at the Washita might have ended very differently if the larger encampments to the east had been closer to Black Kettle’s camp. As it happened, the impact of losing winter supplies, plus the knowledge that cold weather no longer provided protection from attack, convinced many bands to accept reservation life. As Black Kettle rode in solitude across the wind blown prairie of Eastern Colorado, his expression revealed the concern and worry of the elder Indian chief. In the crisp autumn air of 1864, Black Kettle reflected on the bloody summer which had witnessed terror and murder across the plains. Roving bands of young Cheyenne and Arapaho warriors had raided eastern Colorado and western Kansas, causing alarm and rage with the white settlers. Finally, Territorial Governor, John Evans called for a military militia to end the Indian problem. The influential press, led by William N. Byers of the Denver Rocky Mountain News, called for the “immediate extinction of the Cheyenne.” Falling to the pressure, Governor Evans enlisted Colonel John M. Chivington to organize the “100 Day Volunteers.” Governor Evans further issued orders to all Cheyenne and Arapaho Indians to lay down their arms, release their hostages, and return to the lands as set forth in the Treaty of 1861. Black Kettle knew from experience this new militia would set out on a full-scale war and would not relent, even to the peace-seeking Black Kettle and his Cheyenne people. Among the Indian tribes of the plains, Black Kettle was widely respected as a fierce adversary of the Pawnee and Kiowa, yet he believed in peace with the white man. In 1861 he had signed the peace treaty at Fort Wise, promising to remain in the vicinity of the Arkansas River and not to interfere with the emigrants along the Smoky Hill Trail. In 1863, he and Lean Bear had traveled to Washington, D.C. to see the “Great White Father,” President Abraham Lincoln. It quite possibly could have been during this visit that Black Kettle realized the great magnitude of the white population, and realized that all-out warfare with the white man would mean the annihilation of his own people. For the next three years, the Indians began to complain that the dry lands near the Arkansas River held little wild life and the white settlers removed much of the timber in the area. The prime buffalo hunting grounds near the foothills were now lost to the Indians, being accessed by the migration of gold seekers. In short, Black Kettle’s people were not only facing a surge of miners, also an increasing number of homesteaders on the plains, as promoter, William N. Byers and his Rocky Mountain News helped to bring agricultural development to the Colorado Territory. The young Cheyenne warriors refused to obey the Treaty of Fort Wise and launched raids among the white people, running off livestock, disabling mail routes and destroying freight carriers, causing major supply shortages in Denver and elsewhere. The raids culminated with the murder of the Nathan Hungate family thirty miles south of Denver. When the scalped and horribly mutilated bodies were brought to Denver and displayed before the public, mass hysteria gripped the town and the entire territory. Governor Evans issued a general proclamation dispatched to the Indian camps by messengers, ordering all peaceful Indians to assemble at Fort Lyon. Those Indians who did not comply with the order would be killed. The order authorized the citizens of Colorado Territory to “go in pursuit of all hostile Indians of the plains… kill and destroy, as enemies of the country, wherever the Indians may be found.” Colonel Chivington responded in kind. In a Denver speech, in August of 1864, Chivington is quoted as saying, “…kill and scalp all, little and big… nits make lice.” He was applauded, and the phrase became the slogan among his fighting regiment. When Black Kettle responded to the governor’s demands at Fort Lyon, Major Scott J. Anthony instructed Black Kettle and White Antelope to move their people to Sand Creek, some forty miles from the fort. Anthony told Black Kettle his people would be safe and the game would be more plentiful. Anthony even presented a white flag to Black Kettle, a sign of his intentions to protect the Indians. Now, as Black Kettle gravely rode toward his camp, his mind was filled with events of the past summer and worry over the coming winter. When the winds brought the snow, would there be enough game to feed his people, and timber to warm the teepees? On the early morning of November 29, 1864, Chivington’s troops, led by the old mountain man, Jim Beckwourth, moved into position near Black Kettle’s camp along Sand Creek. They were soon joined by over a hundred men of the Colorado First Regiment, followed by troops from Fort Lyon, led by Major Anthony. Rounding out the armed troops were four twin-gun howitzers. A hasty camp was made amid the two-foot snow drifts. No fire burned as the troopers hunkered down to a quick meal of maggot-infested hardtack. The men were tired, saddle sore, cold, nervous, and hungry. Camped in the ravine were some six hundred Indians, primarily women and children, along with Lone Bear, White Antelope, Left Hand and Black Kettle. Chivington knew where Black Kettle’s village was. Chivington, along with Governor Evans and Major Anthony had sent them there. He knew they were friendly and would not suspect a thing. He knew his force was larger, better armed and better equipped. Chivington, in all probability, planned his attack back in September, when Anthony told Black Kettle where to take his people. In this way, the forces at Fort Lyon would keep an eye on the Indians. In any case, Major Anthony had done his part; for better or worse. A victory would put Chivington in the forefront of any political ambitions he may have had. The mass hysteria of Denver, and favorable coverage by the Rocky Mountain News, supported any action Chivington was about to take. The attack came at dawn. “Take no prisoners,” Chivington ordered, adding his own slogan, “nits make lice.” The attack lasted over eight hours, becoming one of the worst acts of savagery that exists in records of Colorado history. When the first shots were fired by the troops, less than a hundred warriors ran up the creek bed and hastily dug pits to established a line of defense. As a military operation, the battle was a horrible bungle. The surprised warriors, ill-armed, managed to hold their own and keep the soldiers at bay for nearly eight hours. Meanwhile, nearly five hundred Indians managed to escape across the prairie, including Black Kettle. Command was lost early in the day, fighting was confused, as soldiers were caught in their own crossfire. Those Indians who could not flee the bloody insanity, died on the spot. Eye-witness testimony estimated the number just under two hundred, while Chivington would boast six hundred “hostiles” killed. Two thirds of the dead were women and children. White Antelope was among the first killed in the military fire. Once the firing began, he left his lodge with arms extended, in the traditional sign of peace. He was shot down in a single round of fire. Black Kettle immediately flew the American flag, as well as the white flag given him by Major Anthony. The sign of peace ignored, the military onslaught continued. Black Kettle eventually took his wife and fled toward the prairie. His wife was shot, and as troopers rode near, they put eight more bullets in her body. Black Kettle returned for his wife, and seeing her alive, threw her over his shoulder and ran. He later extracted the bullets, and his wife lived. A three-old Indian toddler, perfectly naked, toddled out toward the dry creek bed. Three troopers dismounted some seventy yards from the child, and assumed the cavalry kneeling position for fire. One carbine shot hit the sand at the child’s feet. “Let me try…” the second trooper demanded. He also missed. “Hell,” spat the third trooper, as he raised his carbine and fired. The child dropped in the sand. One nit that would never become lice. By late afternoon the battle was over, and Chivington would receive a hero’s welcome in Denver. The Rocky Mountain News reported “…all Cheyenne chiefs, Black Kettle, White Antelope, Little Robe, Left Hand, Knock Knee, and One Eye were killed. In no single battle in North America, we believe, have so many Indians been slain. Colorado soldiers have again covered themselves with glory.” The news account, obviously erroneous, would also prove to be disingenuous. In the meantime, the Cheyenne and Arapaho would again raid and pillage during most of 1865, in retaliation of the massacre at Sand Creek. Black Kettle was not among them. While he was widely blamed for the massacre by his own people, he continued to work for peace and asked his people not to retaliate. 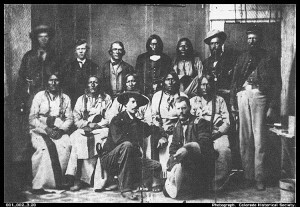 In 1867, Black Kettle signed the Treaty of Medicine Lodge. Promising peace, the Indians gave up their land along the Arkansas River, in exchange, receiving land on the Indian reservation in today’s Oklahoma. Promises of provisions were not kept by the army and the government. The following summer a young Cheyenne, Roman Nose, led a series of attacks on farmers and white settlers, despite Black Kettle’s peace agreement. By the autumn of 1868, a forlorn and defeated Black Kettle settled with some two thousand warriors in the valley of the Washita River in Indian Territory. Black Kettle instructed his people to live in peace with the White man. As autumn settled into winter, Black Kettle again wondered what the cold months would bring to his people. An Indian War campaign was launched in November of 1868. Led by George Armstrong Custer, the military militia, hampered by a severe snowstorm, moved toward the Washita River. Eager for an Indian fight, it mattered not to Custer that the camp he located was peaceful and on government Indian land. On the morning of November 27, 1868, almost four years to the day of the Sand Creek Massacre, Custer ordered his men to open fire on the sleepy Indian village. The slaughter of innocent Indians was completed by 10 a.m.. The ever-boastful Custer later reported over a hundred Indians killed, the capture of women and children, and much destruction. Among those killed were Black Kettle and his wife, Maiyuna. Again, Black Kettle witnessed the slaughter of his people before finally fleeing by horseback with his wife. They were shot dead and fell on the bank of the river. On the Washita, the Cheyenne hope of peace and independence died along with their people. Black Kettle the man, the Indian chief, the advocate of peace, died at the hands of those he trusted, sought peace with, and believed in.